Computers in Mathematics Education, Fall Semester, 2000. 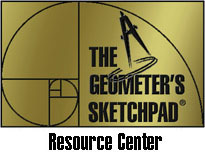 JavaSketchpad is a Java version of The Geometer's Sketchpad that runs as an Applet through your Web Browser. You will need a Java-enabled browser to view and use any of these applets. Netscape 4.x or Internet Explorer 4 or 5 should work just fine (Windows users should use Internet Explorer). The applets may take a few minutes to downoad initially, so be patient. I recommend closing other applications that you may have running especially Microsoft Word. For more information about JavaSketchpad visit the JSP web-site at Key Curriculum Press.